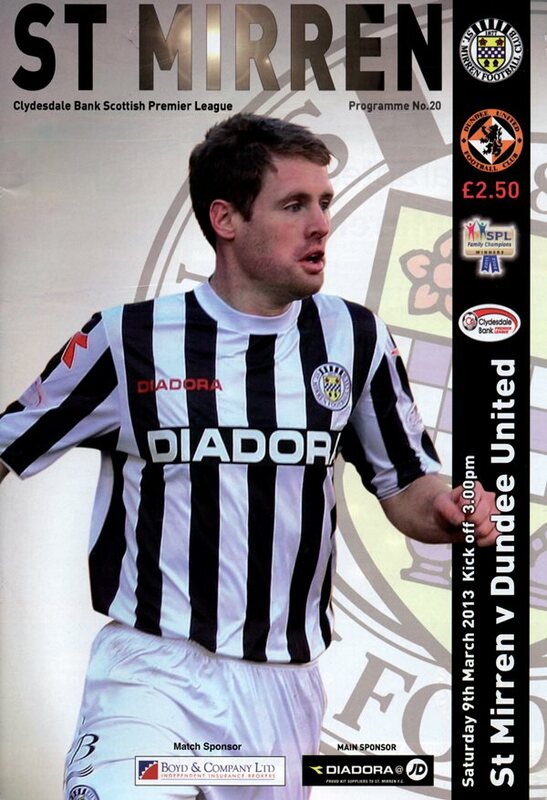 Formerly of Mansfield Town, Bradford City and Accrington Stanley amongst others, Rory earned his reputation in Scotland with Livingston as the club's second top goal scorer with thirteen goals during the 2011-12 season. He signed for Kilmarnock the following season, but failed to establish a first team place and towards the end of the campaign, he signed on a short-term contract with United. Though his time at Tannadice was short, he takes his rightful place in United history thanks to his only goal, scoring late against Aberdeen at the end of the league "split" to secure a 1-0 win and United's place in the top six of the SPL. Rory was born on this date in Sheffield, England. Skipper Jon Daly failed to make it due to injury, meaning new signing Rory Boulding stepped into the lone striker role just 48 hours after he joined the Club. He proved to be one of three debutants in the match, with Swedish defender Marcus Tornstrand and young striker Robert Thomson both later coming off the bench. Manager Jackie McNamara’s only other change was to bring in Richie Ryan into the heart of the midfield in place of Michael Gardyne who dropped down to the bench. St Mirren manager Danny Lennon rung the changes after his decision to rest several first team players for the midweek trip to Dens backfired when Dundee ran out 2-1 winners. On a day that held several permutations one thing was for sure – both United and Aberdeen would be going all out to win their last fixture prior to the league split. Whether or not either of the teams would make the top half ultimately depended on Kilmarnock slipping up at home to Dundee but to have any sort of chance both the Terrors and the Dons had to win the game. After losing a late goal at McDiarmid Park on Monday night, Jackie McNamara made two changes to his starting line up, both of which were enforced. Brian McLean missed out through injury which meant 17-year-old John Souttar came into defence. After his red card in the Saints clash, Stuart Armstrong missed out through suspension allowing John Rankin to reclaim his place in central midfield. After being injured whilst on international duty, Gary Mackay-Steven was fit enough to make the bench.